(Before and after photos of damaged and repaired fringe on oriental rug runner). 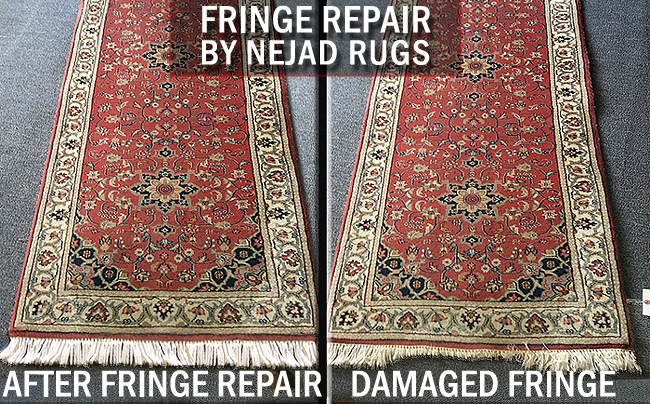 Oriental Rug Fringe Repair by Nejad Rugs of Doylestown PA. Nejad offers expert repair and restoration as well as chemical-free machine-free hand washing of fine Oriental and antique Oriental area rugs – No 3rd-party contractors are ever used. This entry was posted in Repair & Restoration of Oriental Rugs and tagged Before and after photos of damaged fringe on oriental rug runner, Need expert repair of an Oriental rug? Call Nejad at 215-348-1255, Oriental Rug Fringe Repair by Nejad Rugs of Doylestown PA by Theresa Nejad. Bookmark the permalink.